Integrating many high-end features for systems engineers, the Ultimate and Unified editions of Enterprise Architect provide SysML modeling, parametric model simulation, executable code generation, and model-to-code transformations for Hardware Description Languages (HDLs) and Ada 2012. Enterprise Architect enables you to develop SysML models quickly and simply, through a tightly integrated profile. The SysML profile for Enterprise Architect supports each of the nine SysML 1.4 diagram types and model guidance using the Quick Linker. The Systems Engineering and Ultimate editions of Enterprise Architect also provide simulation of SysML Parametric diagrams. This supports engineering analysis of critical system parameters, including the evaluation of key metrics such as performance, reliability and other physical characteristics. Enterprise Architect can associate detailed behaviors with UML Activity and Interaction elements, allowing for executable code to be generated from Interaction (Sequence) and Activity models. This allows for more than just code stubs to be derived from models, by generating any nested behavioral models that define executable statements such as conditional logic, looping constructs and assignments. The Systems Engineering and Ultimate editions of Enterprise Architect support code generation from State Machine models into Hardware Description Languages (HDLs) such as VHDL, Verilog and SystemC. Specify system requirements, design deeply-nested structures of systems using blocks and block diagrams. Analyze system-to-system behavior using Interaction Diagrams, Activity Diagrams and State Charts. Includes support for simulating constraint models with results graphing capabilities. 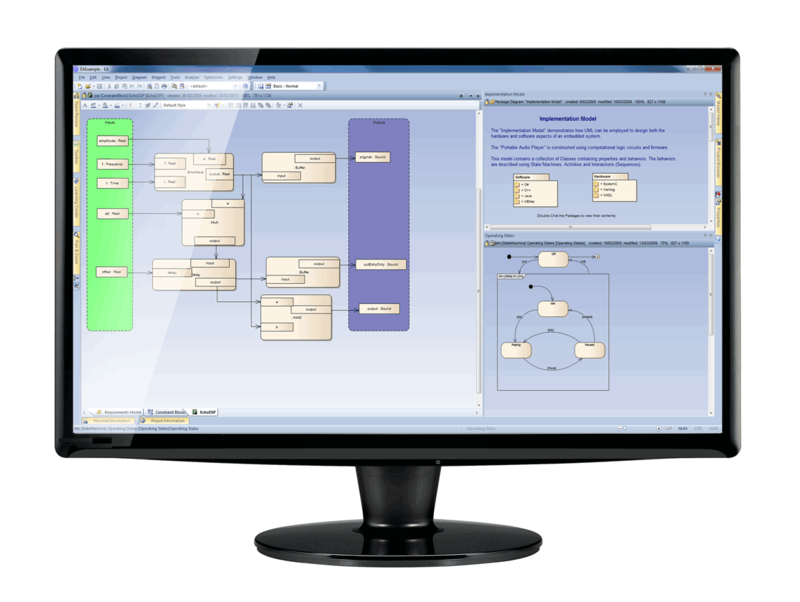 Simulate the behavior of Activity, State, Business Process, User Interface and Interaction Models. Verify system behavior, manage complexity, control execution and understand complex systems. Specify Data-Centric Publishers, Subscribers, Topics and QoS Policies. Define Data Local Reconstruction mappings for effective DDS data access. Create heterogeneous DDS applications across different host environments. Drive rapid downstream development with automatic test generation and Structured Scenarios with automatic Activity diagram creation. All 14 UML 2.4.1 diagrams supported! Generate functional code directly from UML State, Activity and Interaction models. Extend the core toolset and take advantage of Enterprise Architect’s repository with it’s powerful Automation Interface. Better understand the workings of your software with the Visual Execution Analyzer. Define Test Points using Programming by Contract principles. Manage your teams, workload, projects and requirements from the one platform. Streamline your projects with version control and model security. Deliver a consistent message with built in RTF, HTML and PDF documentation. Use model documents, custom reporting and report templates for consistent, up to the second project reporting. Employ auditing, baseline comparison, issue, bug and change tracking to help you meet and exceed project requirements and quality levels. Keep everyone on the same page with the powerful integrated project glossary! Proven tools to visualize, create and plan. Guide your vision from concept to design, build, delivery and beyond. A scalable and multi-user, domain-specific modeling platform. Coupled with technologies like SysML and DDS; Enterprise Architect is the complete systems modeling environment. With over 740,000+ effective users in 130+ countries around the world, Enterprise Architect is the trusted, award winning, UML powered modeling platform with a proven track record for delivering Systems, Software and Business solutions globally. Download your FREE Trial today and discover how	Enterprise Architect helps you ‘Think it Through’. UML and SysML are trademarks of Object Management Group, Inc. in the United States and/or other countries.